Most of our products are available for next business day delivery from when your order is placed (excluding public holidays), provided it is in stock. Products available for delivery within 3 – 5 business days of your order being placed are usually furniture, large technology items, safes and some business machines. To find out the expected delivery of a product, or if a product is out of stock and unavailable for delivery, please check the product details page before you place your order. You can also view this information in the Shopping Basket after you have added products to your order. Free UK delivery on orders over £25 (ex VAT). For orders under £25 (ex VAT), you will be charged an additional £4.95. We are unable to deliver furniture as part of our next business day delivery service. These products are delivered using specialised couriers who will contact you prior to delivery with an expected delivery time. Any items that are not available for next day delivery will be highlighted on the product page. What time/day will my order be delivered? Products will be delivered by a courier Monday to Friday, between 9:00 am and 5:30pm. Unfortunately you are unable to request a specific delivery time. After your order has been dispatched from our warehouse, you’ll receive an email detailing order tracking information. You can also check this information in My Account / My Orders. Depending on the day and time your order is placed, please refer to the table below for expected delivery days. If you place your order on a public holiday, your products will take an additional business day to arrive. For any item(s) that are out of stock at the time the order is placed, we do aim to deliver these to you within 10 days. The email I received said my out of stock item will be delivered in the next 10 days; can you be more specific? Please contact our friendly customer care team who will be able to assist you with a more accurate date. If you are absent or unable to sign for your delivery, other people in your office can also accept and sign for your delivery on your behalf. If there is no one available to accept your delivery the carrier will attempt to deliver your order the following day. They will attempt delivery on three occasions and if the delivery is not completed the order will be returned to us. It is easy to track the progress of your order via email or using our online system. When your order is dispatched from our warehouse, you will be sent an email that includes the courier name, a tracking number and a link to the courier’s tracking service. Alternatively, log into My Account, where all of your orders will be displayed in the My Order section. Simply click on the green "track" link next to the order that you’d like to track to see the progress of your order, including when it left the depot. Furniture and large items are shipped using specialised couriers who will contact you the day prior to delivery with an expected delivery time. Please log into My Account on our website and select the blue "track" link next to the order that you would like to view. It should show your order’s progress to your door, including when it has left the despatch centre and if it is on its way to you. Furniture, large technology items, safes or selected business machines are delivered by a specialised courier service due to the size and weight of these products. The courier company will contact you prior to delivery with an expected delivery time. These products usually take 3 – 5 business days for delivery. If you need further assistance, please contact us online or call 0800 316 3876 Monday to Thursday 9am – 5:30pm. Friday, 9am – 5pm. You are welcome to add a new delivery address during checkout; on the delivery address page. Please click ‘Add New Address’ and enter the details you require. The address will be saved in your address list for future orders. If you have already processed your order and wish to amend the delivery address, please contact our customer service team on 0800 316 3876. Our lines are open Monday to Thursday 9am – 5:30pm. Friday, 9am – 5pm. Do I need to register to buy an item? Yes, you will need to register as a customer should you wish to make a purchase. Registration is quick and easy and comes with a number of benefits, such as the ability to track orders and to also take part in our reward points scheme. We accept all major credit/debit cards including AMEX. You can also pay by PayPal. If you are a business customer you are welcome to apply for our interest free credit account. When making a payment using your debit or credit card, please ensure your name and billing address matches the card holder address details held by your card issuer. It will take just a few minutes to complete the application for a UK Office Direct business account. You will receive quick and easy approval, with all decisions made within two business hours. If you are a new business customer, you will need to register with us first or you can apply for an account when you are placing your first order during checkout. Find out more about how to apply for a business credit account. For existing customers, you can apply for an account during checkout or in the My Account section online. Please contact our friendly team either by online message from the My Account section of the website or call us on 0800 316 3876. Our lines are open Monday to Thursday 9am – 5:30pm. Friday, 9am – 5pm. Are my online payments secure? Our website uses a Norton Secured payment system powered by VeriSign which uses an encrypted data transmission when taking payment for orders. This SSL technology encrypts your payment data to ensure your details are safe. For further information on your privacy and security, please contact us online or call our Customer Service Team on 0800 316 3876, Monday to Thursday 9am – 5:30pm. Friday, 9am – 5pm. All invoices will be listed in the My Orders section when logged in to your account. Invoices will be listed to the right of the order number it relates to. Can you change the address on my invoice? We are unable to amend the details on an invoice for an order that has already been dispatched. Please pay your business credit account balance by either BACS or cheque payment. To help us assign your payment to your account swiftly, please ensure that you include your Customer Reference Number when sending a BACs payment or included with your cheque. Please remember to include your account number as a reference to help process the payment swiftly. Can I have a catalogue sent to me? We no longer produce paper catalogues. This is better for the environment; allows us to pass the savings on to our customers and enables customers to benefit from the most up-to-date competitive prices. My Account is one of the ways we aim to make your online shopping experience with us as easy as possible. It is also a way of saving your details, such as delivery addresses, for future use. All of these tools and functions are available 24/7 at your convenience. How can I edit My Account Information? Login Details – you can manage your login and billing account name, email and passwords. Company Information – you can manage key business information and details. Communication Preferences – you can set and manage your communication preferences. Manage Credit Card Details – editable if you have saved your card details previously. Manage Address Book – you can manage multiple delivery addresses. Is my information saved securely? We are committed to keeping your personal information secure. When registering you will be able to choose your own password so that no one else is able to see your details. We also abide by the UK and EU Rules on Data Protection and will not sell, trade or rent your information to a third party. To register, simply click on the Login / Register link that appears at the very top of the page. Alternatively, if you are purchasing an item today you can also register as a customer in the checkout process. I have forgotten my password, what do I do? If you have forgotten your password, go to the Password Reminder page to have it reset. You will need to enter the email address you used to initially register as a customer. An email will then be sent to that address to confirm the request to change your password. If you are unable to remember your email address you used to register, please call our Customer Care Team on 0800 316 3876. Our phone lines are open Monday to Thursday 9am – 5:30pm. Friday, 9am – 5pm.. If you’d prefer, you can also contact us online at any time. Addresses can be updated from the My Account section of the website. Please select Update Details on the left side of the page. For credit account customers, please message us from the My Account section with the full address and postcode you which to update. How do I use an E-coupon? To claim a special offer or discount that was sent from us via email or viewed on our website, please click on the banner or link and the offer will be automatically applied to your basket. If we have emailed the code directly please enter the code into the Coupon Code box at the checkout. We are unable to apply a coupon or promotional code to an order that has already been confirmed. Can I use more than one E-Coupon on an order? Only one E-coupon or promotional code may be claimed per order. You may not have reached the minimum purchase requirement to apply the special offer to your order. The offer applies to your subtotal before VAT and any delivery charges. Some items may not be part of the offer i.e. office machines. Please refer to our Terms & Conditions for more details. The promotional code you have entered may have expired. Please refer to the offer’s terms and conditions for more details. You will need to log into your Euroffice Ltd account or register as a new customer before you place an order using your e-coupon or promotional code. Register or login now. The offer may not apply to your account. 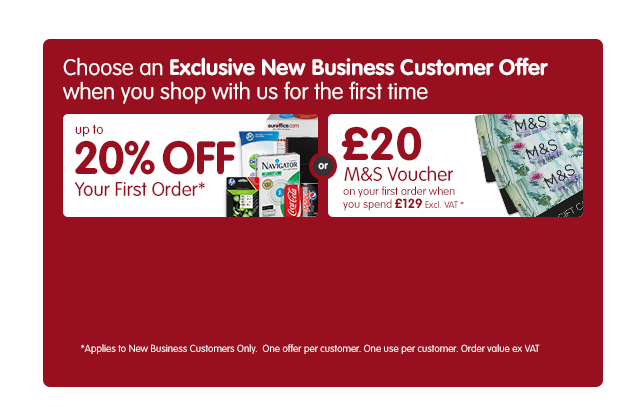 Sometimes we give either new or existing customers different special offers. If you still are unable to use your promotional code please contact us online or call our Customer Care Team on 0800 316 3876, Monday to Thursday 9am – 5:30pm. Friday, 9am – 5pm. Unfortunately we are unable to offer exchanges for products. If you would like to exchange your item for an alternative, we suggest you return the unwanted goods to us for processing and place a new order. Please see below for our Returns Policy. We will refund an item or order if you are not completely satisfied with it provided it is returned to us in its original, unopened packaging with all the accessories and instructions. To return an item, you will need to contact us within 14 days of receiving the item. Due to health and safety reasons we are unable to offer refunds on food or drink items including biscuits, coffee and water. More information can be found within the Terms & Conditions. Unfortunately we are unable to offer exchanges for items. If you would like to exchange your item for an alternative, please return the unwanted goods to us for processing and place a new order for the alternative items. I have received an incorrect, faulty or damaged item, what do I do? Please contact us within 7 days of receiving the item. You can contact our Customer Care Team on 0800 316 3876, Monday to Thursday 9am – 5:30pm. Friday, 9am – 5pm. Alternatively you may start this process online. After logging in, from the Contact Us Page, choose the relevant order number and let us know which item you would like to return. If your product develops a fault, after 7 days, please contact us for warranty information. How should I prepare the item for collection? After you have contacted us, we will email you a returns number and arrange for a free collection. Items that need to be reordered will be processed by our team at the same time and your replacement goods will be shipped out to you. When the courier comes to collect the item, you will need to let them know the returns number you received from our Customer Care Team. Please do not write or tape the returns number onto the item that is being returned, simply write the number on a sticky note and attach it to the box or packaging. Will collections happen at the same time as delivery? Our couriers are unable to deliver and collect items at the same time because we will sometimes use different couriers to deliver different items. An item is missing from my order – what should I do? If you believe there is an item missing from your order, please check your order confirmation and dispatch emails to make sure all of your items were due to arrive in the same delivery. If all of your items are available for next day delivery, they should be delivered at the same time. If your items are a mix of next day delivery and 3-5 business day delivery, they will be sent to you on different days depending on stock availability. If you are unable to find the missing item, you will need to contact us within seven days of receiving your order. You can contact us online or call 0800 316 3876, Monday to Thursday 9am – 5:30pm. Friday, 9am – 5pm. If you have confirmed and paid for an order, unfortunately you will be unable to edit or cancel it. However, we would be pleased to arrange a free collection and refund for any unwanted items (subject to our returns policy above). For further information please contact us online or call 0800 316 3876, Monday to Friday 9am – 5pm. Your refund or credit note will be issued within 14 days from the initial request to return your item. If you have not received your refund after 14 days please contact our Customer Care Team on 0800 316 3876. Lines are Open Monday to Thursday 9am – 5:30pm. Friday, 9am – 5pm. Will you refund the delivery charge if I return an item? Can I send you a list of products we purchase most often to get your best price? Here at Euroffice we have a transparent pricing policy which means the prices we have displayed on our website are the lowest we can offer. Do you recycle used printer cartridges? At the present time we do not offer a cartridge recycling scheme. Do you sell heavy duty printers? The printers we have are for small to medium sized offices.